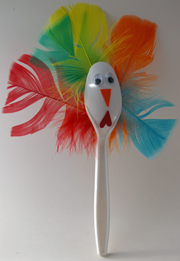 Plastic spoons turn into turkeys for this fun craft. Preschoolers will have fun picking out the feathers and sticking them to the spoon. Place one in a flower pot and you have a great centerpiece for the classroom or on Thanksgiving Day! What You Need: Plastic spoon; assorted feathers; scrap of red cardstock or construction paper; heart punch for waddle (or just cut out waddle shape); scrap of orange cardstock or construction paper for beak; two googly eyes; scissors; glue; transparent tape. How You Make It: Using glue or tape, stick assorted feathers into the hollow of the spoon. Use heart-shaped punch to make waddle from red paper or just cut out a shape (doesn’t have to be perfect!). Cut orange triangle for beak. Glue waddle, beak and googly eyes onto curved part of spoon. This entry was posted on Tuesday, October 2nd, 2007 at 9:55 am	and is filed under Thanksgiving crafts. You can follow any responses to this entry through the RSS 2.0 feed. Responses are currently closed, but you can trackback from your own site.